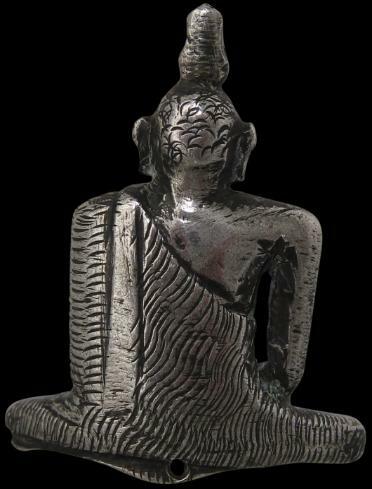 This small Buddha cast in solid silver is in the traditional central Sri Lankan form. 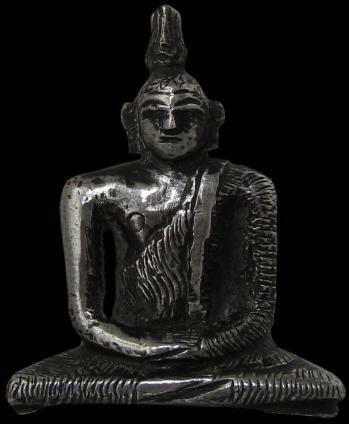 The image is seated with cross legs in a meditating (virasana) aspect. The iconography is typically Sri Lankan: the shoulders are broad, the arms are long and thin as are the legs. There is little or no usnisa (cranial protuberance) to support a tall flame ornament from the top of the image’s head. The hair is etched with curls and the earls are elongated in princely fashion. The eyes are closed or half closed. The garment has been cast with thin, undulating pleats and a folded lappet. These qualities transform this image into an almost abstract symbol that at the same time evoke a sense of order and tranquility. Sacred Images of Sri Lanka: Buddhist and Hindu Sculptures from the Sri Lankan National Collections, The Art Gallery of New South Wales, 1994.